The Council of Churches in Zambia (CCZ) has said that the death of 8 people in a stampede which happened during the distribution of food by a church organization must serve as an eye opener to the ruling Patriotic Front (PF) government that poverty levels in the country have reached alarming levels. In a statement released to the media yesterday and signed by Reverend Suzanne Matale, the CCZ General Secretary, the organisation said that many signs of high poverty levels such as increased criminal activities have been overlooked by government despite countless reminders from ordinary citizens, the civil society and the church that the social-economic situation in the country is continuously deteriorating with no signs of improvement. CCZ further said that all the meaningful development which government is claiming to deliver to the people of Zambia especially infrastructure development across the nation is meaningless if they cannot afford the basic necessities of life for the Zambia citizens. The Council of Churches in Zambia (CCZ) has learnt with deep regret the death of 8 people in a stampede which happened during the distribution of food by a church organization, the Church of Christ in Lusaka’s Olympic Youth Development Centre which also left many others injured and hospitalized. We pass our condolences to the families of the victims of the stampede. We pray for peace and comfort during this sad moment and may the good Lord continue to strengthen them as they mourn their loved ones. The Council believes that this development is a sign of high poverty levels in the country which has driven people to extreme desperation to an extent of risking their lives in an effort to secure food for themselves. Matale, this is your own opinion and not that of the other members. Poverty is a relative term and also as Zambians we always like to have free stuff to resell later. This is greediness. Kaili veze va free! Greed is better developed among the affluent in our communities, it has even become an art form. When the poor try, it becomes distasteful, even scandalous because this threatens the security of the rich. Every now and then the rich throw scraps at the poor. The reaction is predictable and serves to maintain the divide between the two. After all, you will never find the rich scrambling for scraps, right?? Wrong. activism. A smile, a greeting, a hug. We will never know the sacrifices, the prayers that our mothers and sisters have made on our behalf until we all reach the hear-after. An acknowledging smile may be all that you can make the journey bearable. HAPPY WOMEN’S DAY. National prayers in vein. Abudance abudance … in Zambia. All of a sudden that Suzanne start looking good mwee. Was she or still working at some embassy? She look political. It’s easy for anyone to kill most Zambians by poisoning food and giving it out for free at church rallies like this one. TOO MUCH HUNGER! You pastors are also contributing to high poverty levels. You are not helping the poor instead all you preach to them is to give you their very last coins. Every Sunday you steal from them “give, give give you will be blessed”. You are cursed generation of preachers and God will punish you. There is no teaching of salvation anymore, no teaching of working hard anymore all you do is to equip people for miracles to happen in their lives. You have taken church as your means of living not a service that’s why you will do everything you can to have such positions as personal to holder. Zambians have become just too gullible. They are so dependent on miracles that any criminal or magician introducing himself/herself as a pastor will be believed and followed. Shame! You are the same people who Tythe the poor and plblockbtheir minds with prosperity gospel. You are going to Hell preacher! Waloba ilya uma iwe PF Cadre. This church is probably a member of EFZ and not CCZ. CCZ comprises mainly the so called main line churches. @ of cadre you are very right Rev. Susana is a upnd vuvuzela we all know that. She hides behind CCZ. The “Church of Christ – Iglesia ni Cristo” involved in the stampede is different from the Church of Christ that is member of CCZ. It’s unfortunate that the 2 are being mistaken as one. I have told PF cadres that there’s just so much poverty in Zambia under Lungu but they want to defend Lungu and PF like jihadists. What CCZ has said is what HH has been saying. And for Lusaka to record 16 murders between January and now is a national disaster which useless MPs cant see that the party has let down Zambians. We are told that this organization distributed tickets to people. If it delivered tickets to the homes why did it not just deliver food to these homes? Did they identify the vulnerable people to eliminate greedy people who just wanted handouts? This ‘free for all’ attitude caused the stampede. This is very suspicious activity. Today for the first time in my 55 years, I am ashamed to be Zambian. Shame on you Lungu for reducing your people to this. Shame on you Zambians for voting in this selfish, clueless and visionless globe trotter. I am a Christian, but was it not this church that foolishly caused they stampede. It is like prayer, God said do it in private, do not show off like you are at the Miss universe contest. I am a Christian, but was it not this church that fool-ishly caused they stampede. It is like prayer, God said do it in private, do not show off like you are at the Miss universe contest. Sadly this stampede happened but the church you say who distributed goods to Zambians that day are not Africans. They are Christians from Philippines, a 3rd world country in the continent of Asia. The food parcels was not purchased from Africa. The money used to purchase the goods did not come from donations from non-members of the church. It came from members of the Church of Christ from all over the world. We will continue to spread the gospel to the unfortunate and provide the needy as much as we possibly can. I am a Christian, but was it not this church that foo-l-ishly caused they stampede. It is like prayer, God said do it in private, do not show off like you are at the Miss universe contest. But this Matale UPNDonkey, always campaigning for some donkey which will never be president of Zambia. Sorry ba so called reverend you missed the chance to be Religious Minister. Suzanne Matale is just exhibiting woman’s jealousy towards fellow woman. You see apparently Esther Lungu was her subordinate at CCZ, maybe even mistreating her. Suzanne cannot live with the fact that Esther is now First Lady, in status and protocol many times Matale’s superior! That’s God mama, just swallow it! Our people in Zambia’s Combonis are naive and gullible lot. My interaction with a lot of them has left me shocked at their level of ignorance and gullibility! You can nicely draw them into a nice trap if you so wished. They run towards danger just to see instead of running away. If you organized an event to demonstrate how to detonate bombs, you can make a lot of money! Sorry not apparently, I have been corrected that it’s a fact that Esther was a junior officer to Matale at CCZ. Of course there was no way of Matale knowing that Esther’s simple and humble husband Edgar Chagwa Lungu would ever be President of Zambia. The people of Zambia just gave a shock to Matale. But you know mr hh suffered the same shock from which he has not recovered. For hh, it’s a clear example of his incapacity to read the political landscape correctly due to an inflated and self destructive ego. Hh carried himseld as superior to other Zambians purely on account if his material wealth but he was cut down to size when Zambians announced that to hh that they prefer a humble leader and they will repeat it for as long as hh lives. By the way has hh donkey now read the Chitimukulu’s verdict on the collapse of his so called petition and whom hh should blame? The most interesting thing is that even Professor Hansungule agrees with Mwinelubemba, would you believe it? I am sure HH is not happy he lost the general elections, the reason why he petitioned the results. That’s a fact. Let’s say it’s true that Esther Lungu was subordinate to Matale, it is of no consequence to anyone how Matale feels. The fact of the he matter is that 8 people died needlessly trying to get food. The food price indices have sky rocketed since the PF came into power, the job base hasn’t increased yet the population has grown. The next logical thing is poverty to increase. Should any responsible leader keep quiet unless sing praise songs of Lungu? That’s irresponsible. For how many times have we said this. The current President ECL is a very good man, unfortunately he has no capacity to transform this country, the stampede is a crystal clear reflection of how desperate the poverty levels have become. Dishonesty people like Kampyongo will tell you all is well. The guy has to keep his job. 6 Months ago these people were dancing to DUNUNA REVERSE. Yet the people they were dancing for have been too busy flying dancing queens in hired private jets to New York, or taking foreigners for S3X_Capades to Las-Vegas, scamming neighbouring countries or even flying to Israel to play & mock God at his grave. More are still dying everyday from DUNUNA REGRET, not even reported on the news. Just go to UTH mortuary section as they go to collect bodies in the morning. The death rate is national disaster. I was in Europe for few years & only witnessed 1 funeral. And it was a very old man. In Zambia it’s able bodied men & women that are dying. VISION-LESS LAZY has NO CAPACITY, VISION OR WILL to fix this calamity. I am sure HH can FIX it within weeks, but he has to president first, something he has failed to do since 2006. The churches say people are struggling, citizens say people are struggling but PF say they are just lazy. When they were blowing 10 billion US we told them that people can’t eat roads but instead they were dancing and shouting sontapo in reply……. The truth is the cost of living has increased while disposable incomes have declined, unemployment has escalated and in general poverty levels have increased. The illegitimate Lungu govt is wasting millions of money in Travel Costs and other unproductive expenditures but doing nothing to stimulate the economy. Anyway that is to be expected becoz their Leader said he has No Vision and without a Vision People perish. We can all see it with our naked eyes. With this Illegitimate Lungu govt in power Zambia is doomed. ….hmmm Zambia is doomed indeed?? Chamber of mines has just announced copper output will hit 800,000 tons this year; the kwacha has stabilised; loadshedding has decreased meaning industrial output will increase; every two weeks shoprite, picknpay, sana, spar run promotions where prices of general commodities like potatoes, meat etc have reduced; we are headed for another bumper harvest; yalelo has reduced the price of fish…PLEASE DUNUNA REVERSE!! I AM PROUD TO BE A HARDWORKING ZAMBIA. The church mother body is expected to comment on the spiritual side of the event but they are talking like politicians. Our people need quality information and to know that it is not a crime to express oneself or to ask a question in any language. The closing down of media houses has curtailed this flow of information. Remember that people perish where there is no credible information. We therefore need the Freedom of information bill passed like our Malawian friends have done. This important bill should not be debated along partisan politics. It is a basic human right! As much as her statement appears political let the powers that be take this as a reality check! Things on the ground are hard! Yes the general economy and economic parameters are improving but more can be done if the ones at the top sacrifice their pointless allowances, costly to buy-costly to maintain Luxury SUVs etc! It doesn’t make sense you as a Minister are visiting a rural hospital to check its state and lack of beds with a convoy of 10 vehicles- the cost of moving those vehicles from point A to B ie drivers allowances, fuel etc could purchase those same beds that are lacking in the hospital. Let’s be practical our people are in need! Only Peter Sinkamba has raised these issues! The rest in opposition are just time wasters. Could not agree more! We have failed to look after ourselves and each other for over 52 years! We have followed the one we chased and judged as colonial and later borrowed massively! Are we not ashamed that we are still slaves to the lender? The question is how do we bring back the muzungu? We tried to bring our own born and bred Doti Fikoti and we all know how the natives reacted. We think we can borrow our way to development? Let’s face it! There is nothing good to expect from ourselves! We can never see development until we start to care to use our brains and hearts! This is what differentiates us from muzungu! the CCZ should not encourage laziness. Lot of those that went to attend are able bodied and can find piece work.this tendency to seek free things should be discouraged .The CCZ should infact look at how this fake Church started spreading such type of enticement. When political parties give chibuku and food you complain aty the are enticing voters and go to court yet this church no one is condemning it. Spaklo, Jobs are never provided! It is business needs that create jobs! As long as you continue having a government with Anti-business policies, forget about jobs! There is a good reason why government should have no business in business. Right now we are back to the UNIP days where government wanted to own businesses like the much publicized SOLAR HAMMERMILLS! Since their installation, have we seen a net reduction in mealie meal prices? Unfortunately when you point out these anomalies, people start convulsing with rage. No one has the monopoly of wisdom. Those in leadership should expect to be criticized! Wow ,Dr Suzanne Matale those eyes have a deathly look at this PF tragedy. You are quite right madam Susane Matale under president Edgar lungu poverty levels have escalated due to the fact that this useless president can’t sit in the office and plan for the nation all he knows is travelling around,drink beer and dance like an insane. Shame! Only Lazy and his tins are enjoying themselves…these tins are so overpaid with allowances that they are donating football tickets…look at them holidaying in Vegas on taxpayers time. As for religion i always tell people that its not progressive its self distraction…its there to enslave you and promote white supremacy!! Wake up..what next? Everyone should visit the tomb of a fictitious white chap called Jesus? Wake up and study about self!! Why is it these so called Christian Charity are eager to give you free food and have 50,000 in storage ready to hand out…they never want you to independent and librate your minds. In the middle east they chase them. Wake up from this mental slavery!! 2.Squalor ( I mean Lusaka can be best described as high density informal dwellings ( shanty compounds) with pockets of medium density dwellings (modern housing) and a few low density houses). 2.1 Soweto market is filthy. 2.2 most shops and houses are dirty -unpainted, grass uncut, liter everywhere. 2.3 From airport to Cairo road plastic and other rubbish. 3.1 Lack of proper modern education. 3.2 Lack of traditional education. 3.3 Lack of christian education. 4. Lack of /absence of / access to clean water, air, food. Mwinelubemba’s article has left hh in anguish. Now hh does not know what to do with the running mate GBM who is the nephew of Mwinelubemba. I hear hh is annoyed at being confirmed as an underfive politician by no other than what he terms bemba monkeys whenever GBM is not looking. Have you noticed the silence of hh and GBM on the article? The silence is thick enough to pierce by a traditional spearman. What else can UPNDonkeys do but cry and wipe their bums? Matale is just a UPND cadre, we all know it. Does she even know the meaning of poverty? The husband of Susan Matale, James Matale, is well – known UPND honcho. @ chester agony is when the people that lost their loved ones testify that they didn’t even need the same food and are equally surprised how their loved ones found themselves there; so to all those playing the blame game gate a leaf and cease pointing figures. Dr Matale Jesus stated that the poor shall be always there. This simply means we cannot be all on the same level. This is so if we are to be on the same level who will maid and garden boys at your home. Why advocating for suspension of a church that was just trying to help feed the poor. Helping the poor is a higher calling and CCZ cannot stop it. Did Jesus apply to the authorities of his time before feeding 5000 men excluding children and women. Ms Matale you are supposed to support the Church of Christ. What do you get by suspending a church which did nothing wrong? If any church develops a feeding program every Sunday, are you going to stop them? PF hypocrisy. And Jesus said, Make the men sit down. Now there was much grass in the place. So the men sat down, in number about five thousand. 11 And Jesus took the loaves; and when he had given thanks, he distributed to the disciples, and the disciples to them that were set down; and likewise of the fishes as much as they would. . This came happen were ever are thousands of people meeting, places like mega churches/crusades, sporting events like at stadium or political rallies, we need next time to a plan on how do we control the situations or that this painful thing of losing souls do not happen. So people didnt even go there with the right motive of prayer but 80% went there to receive food hence the confusion. How many will show up if the church said they are giving free farming inputs. So dont condem the church or PF. But we should really advocate people to have a positive mind in life. No one can end poverty apart from ourselves. This behaviour is a hallmark of the corrupt visionless P.F government, run by a corrupt visionless Chagwa. Remember this recently happened @ State House of all places when P.F cadres, officials included brought their uncouth KAPONYA manners & started fighting over food and alcohol. I’ve been to State House functions as a Young boy when K.K was in control, & one would NEVER witness such disorderly conduct, yet we still had poor people in Zambia those days. With a President who dances like a confused marionette, what do Zambians expect. STANDARDS HAVE GONE TO THE HOUNDS!! What that church wanted was to create HEADLINES. In that regard, it was mission accomplished – eight dead, scores injured – not because of hunger, but because of a stampede – people scrambling for food! If feeding the hungry was their mission, they could have accomplished that mission, and left behind, not corpses, but left-over food to fill twelve baskets. That was not the case. What was left behind, instead, were corpses with no graves to put them. What a shame! 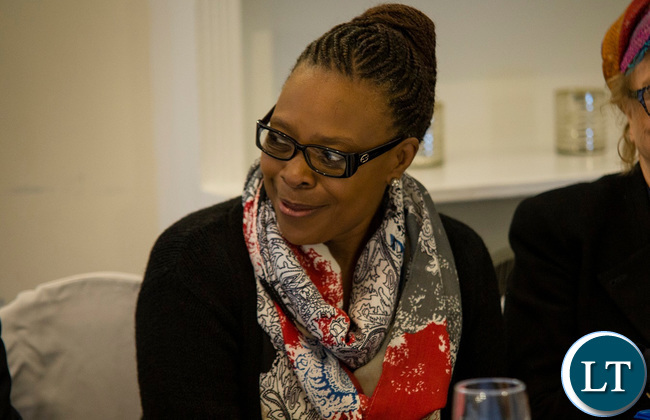 Should we not see remorse in Rev Dr Suzanne Matale’s face? So, what us the issue? If you should conduct an event, however good your motive, if people end-up getting killed during that event, should you not be held accountable for the deaths of innocent lives lost? Why is the church trying to implicate the government in this? That is why they are called UPNDonkeys, I mean both hh and this so called reverend. Their comments are totally at tangent with what actually happened and the cause of it. Hh and this female donkey only need to visit the victims and the funeral houses to hear for themselves the truth. Do they think that they are so.intelligent that they can speak for people whom they have not consulted? Have they visited the funeral houses? No wonder this donkey will never be President of Zambia, no matter how much the female donkey prays for him. What about mushrooming of the church business, is it not a sign of hunger for money? It can be better compared to the so many political parties which are being pronounced nearly every day. You just wait for a misfortune to comment on to discredit the people in power. If I met you at the gate into Hell, I will ask Satan not to allow you in having been rejected by God for your being of double standards. To people of Zambia, The CZZ, PF and other Countries in Africa who unfortunately experiencing the same poverty issue with Zambia. Let this things be clear. What you don’t know can’t hurt you it will kill you. This Philippine Church INC. Can’t and will never dare to emancipate you on problems poverty. as they seem to purport. 1. You may have heard some sort of success stories of this Filipino Church. The truth the majority of its poor members still dependent on Goverment Housing Projects, Public or State or Govt Run Schools and majority of its poor members does not have adequate stable Jobs. These issue has never been addressed by this church up to this moment.